Autumn can be a lovely time not too hot, all the colour of the leaves and brings out all the Drupes and Berries. The difference between drupes and a berries. A drupe is a fleshy fruit with a hard endocarp, within which is the seed. 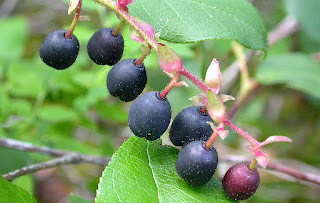 Berries are totally different they have a fleshy endocarp (the innermost layer of a fruit) as well as a mesocarp (the middle layer of the fruit), and may have more than one seed. The mesocarp is fleshy and makes up the bulk of the pericarp (flesh and skin of the fruit). 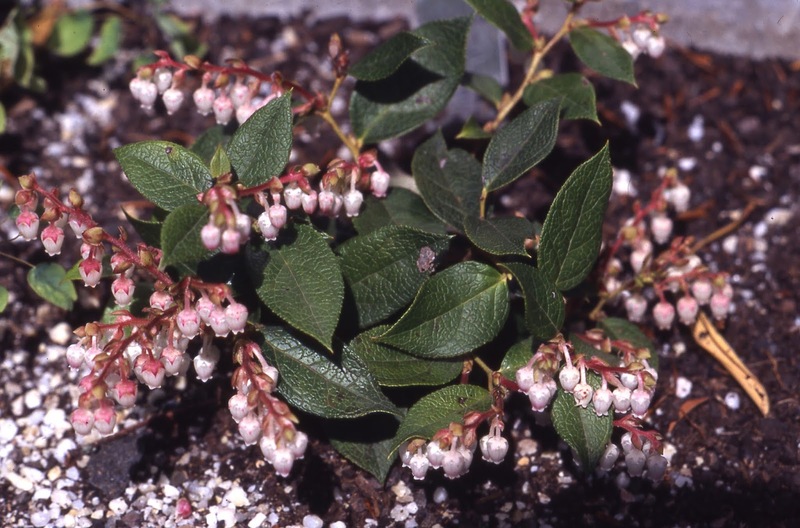 Gaultheria 'Pearl' flowers below in an old copper trough, growing to 15cm tall a dwarf evergreen shrub. Gaultheria in the Garden at Sherbrooke, Flowers and fruit about 80cm high grows in the shade of a Camellia and receives no watering at all and survives quite nicely. Name unknown. 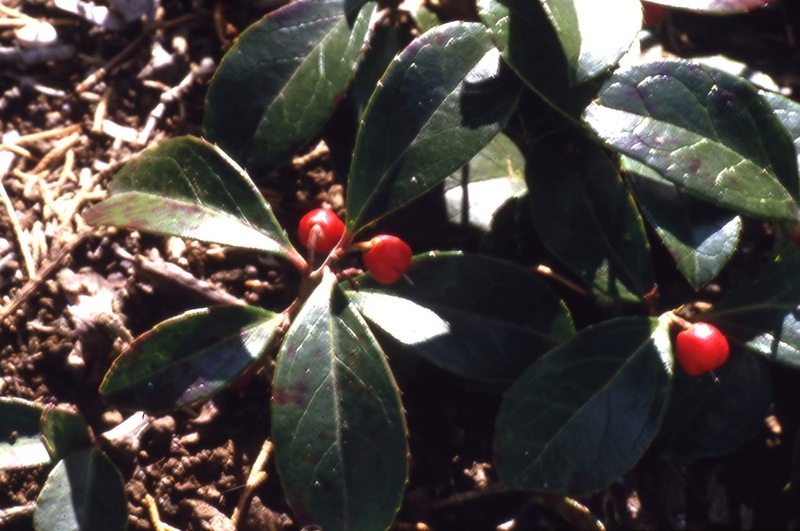 Pernettya now included in Gaultheria. The flowers and drupes of Gaultheria myrsinites from Gillanders Nursery 2002, I grow this lovely Gaultheria in another old copper trough, where I have grown it since 2002. It sets copious purple black fruit and does not turn a hair in the summer as long as it is watered during the hot weather. 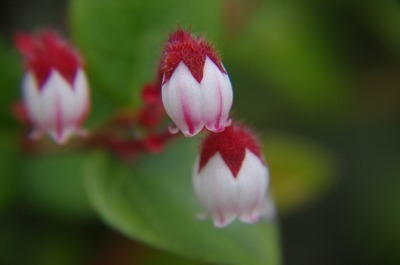 Gaultheria adenothrix flower above with the beautiful red calyx on the flowers. Red fruit below from Japan from where I once grew the seed and have since lost it, but I will certainly be trying to get it up from seed again. Gaultheria are difficult to keep in a hot climate as the roots dry out and they all need to be grown under high shade and a small shrub as a secondary layer again. Alfred Evans author of The Peat Garden and its Plants, says to put a layer of peat over Gaultheria roots to keep them moist, but coconut fibre would do just as well to keep moisture in the soil. 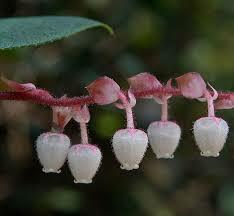 We have quite a large list of approved Gaultheria on Bicon including G. adenothrix. Gaultheria Shallon fruit above flower below used to be grown by the Gordons who grew a large range of Gaultheria's, Barbara would go around eating them, but I don't remember which ones she ate. 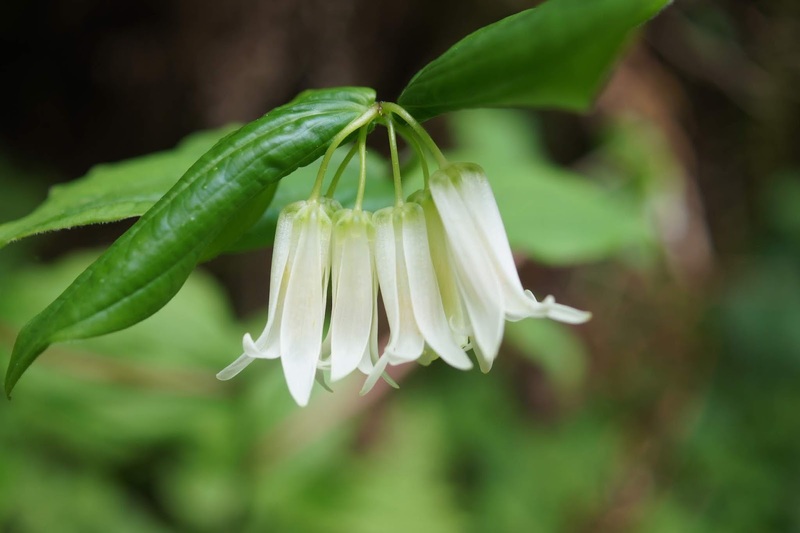 A common understory shrub in coniferous forest in open canopy. Their extensive horizontal root systems can absorb all available moisture. Their thick leathery leaves are slow to decompose and not provide nutrients that other plants require. 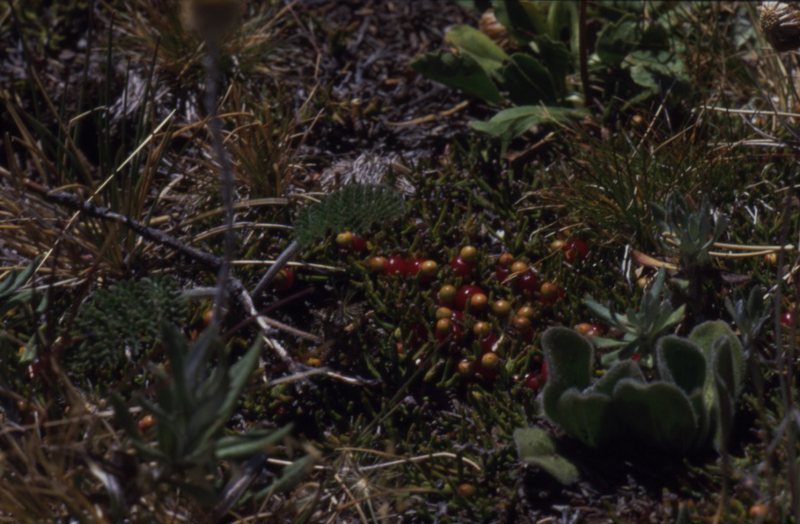 as long as it is given a drink in summer months, grows from underground stolons. 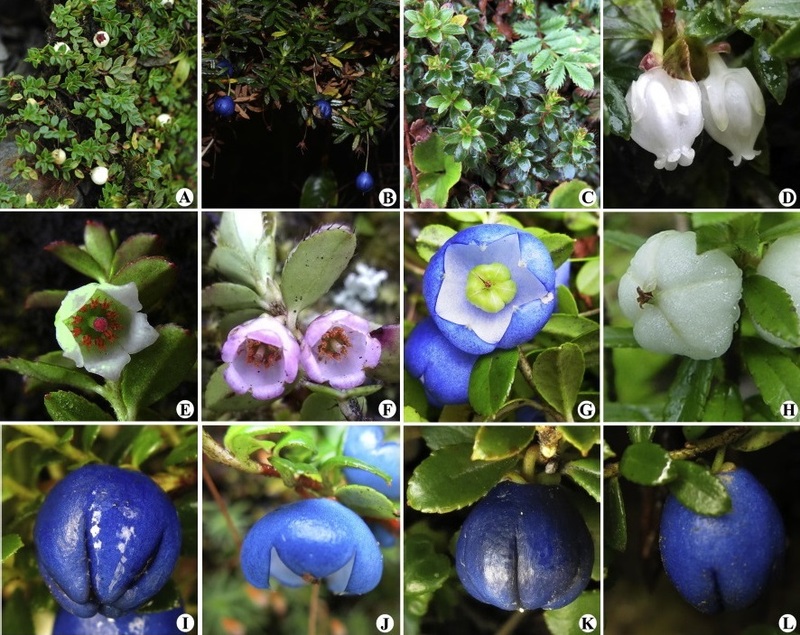 Gaultheria sinensis flowers above and fruit below, the colour of the fruit varies from dark blue through to pink. I used to grow this on the edge of a rock wall, but it died when we had a terrible drought about 10 years ago. I have since raised it from SRGC seed so I will be interested to see what coloured drupes it has. Gaultheria is a small shrub whose thin stems are weighed down by the fruit, the ovary of the flower develop into a dry capsule containing many tiny seeds. 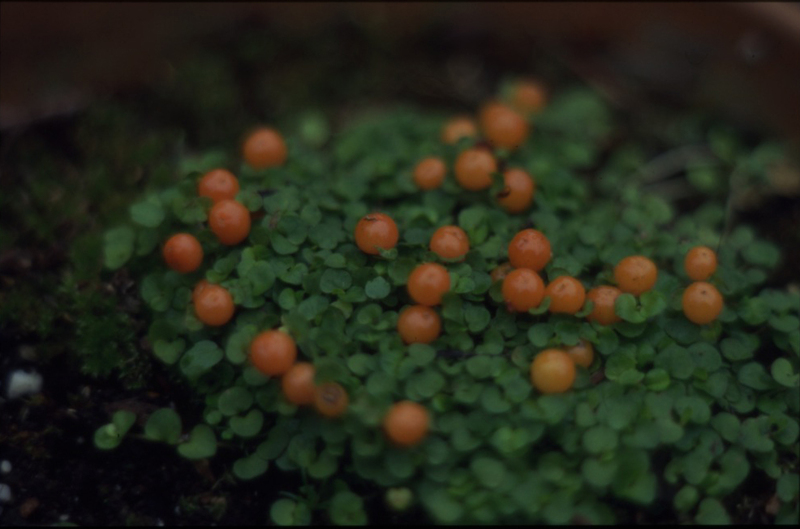 As it matures, the ovary in this and most other species of Gaultheria become enveloped in the fleshy outgrowth of the calyx lobes, forming the coloured part of the fruit, these lobes close around the capsule without becoming sealed, as shown in the Gaultheria tricophyllae photos below. Originally collected by Frank Kingdom Ward in Burma. Gaultheria depressa variety Novae Zealandiae White drupes photograph taken on the Temple Basin walk South Island New Zealand . Gaulnettya x Wisleyensis Pink Pixie growing in the Rock garden at Wisley, it is an evergreen shrub growing to a meter. It is not known in the wild. Not sure if this is still in cultivation in Australia, but my plant originally came from Ken and Lesley in Tasmania, and I no longer have it. 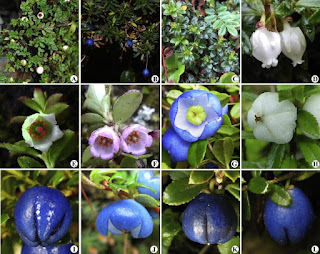 Just to show you the flowers and drupes up close of a species of Gaultheria being studied in the Himalaya, Hengduan Mountain. Gaultheria series Trichophyllae flowers, leaves and Drupes accredited to "Species New to science, Nova taxa Blogspot" with thanks. 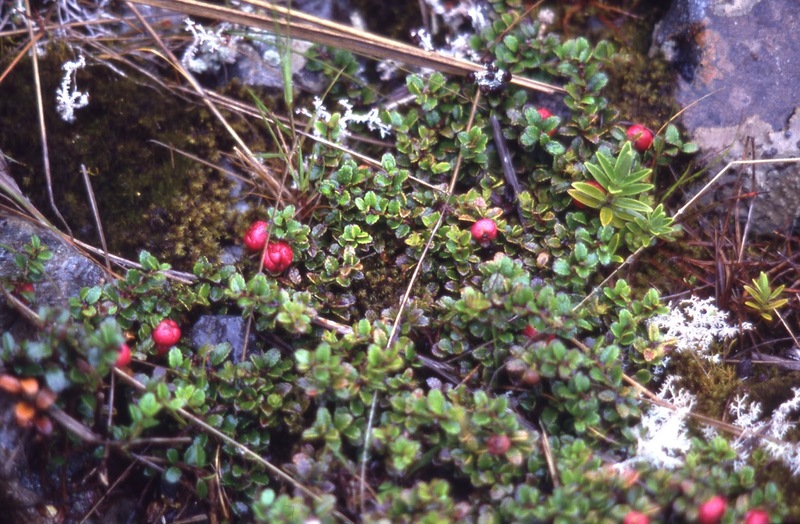 A. Gaultheria marronina with a prostrate habit, white open fruit with maroon capsule. B. Gaultheria dolichopoda showing erect habit, blue fruit and long pedicile (stalk of single flower). 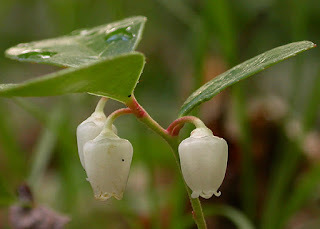 C. Gaultheria trichophylla var. trichophylla leaves long with marginal setae (bristle). 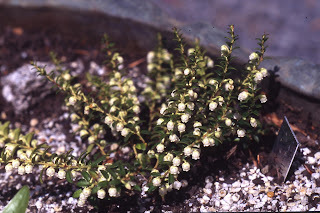 D. Gaultheria cardiosepala flower with a urceolate (urn) shaped flower. 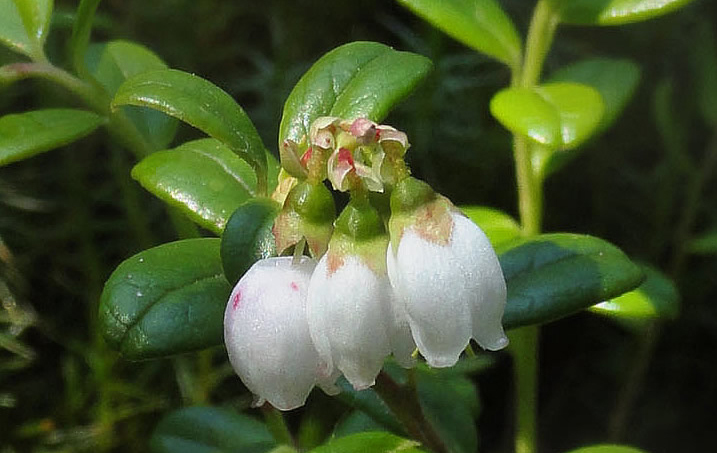 E. Gaultheria stenophylla with two-awned anthers. 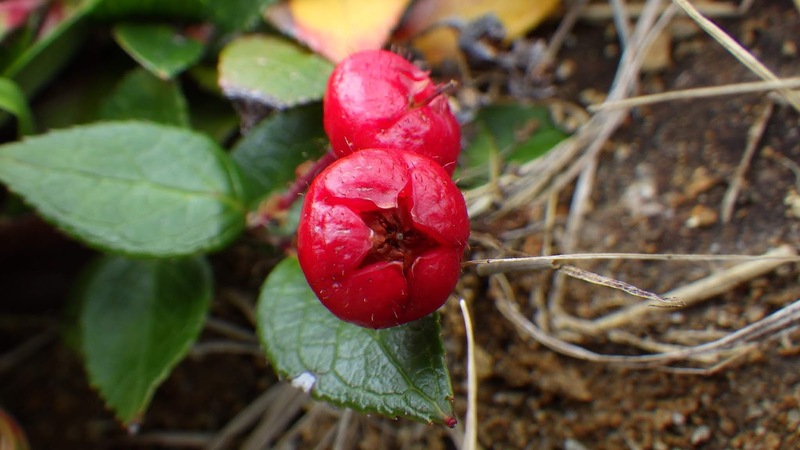 G. Gaultheria cillisepala blue open fruit with green seed capsule. H. Gaultheria cardiosepala white closed fruit. I. Gaultheria stenophylla just opening blue fruit. J. Gaultheria cillisepala side view of open fruit. K. Gaultheria crassifolia blue fruit. 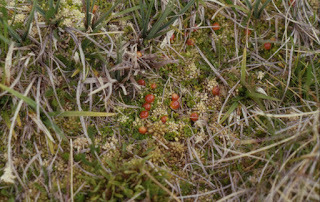 L. Gaultheria stenophylla blue fruit. Coprosma moorei growing in David and Hilda's garden in Invercargill, South Island, New Zealand. 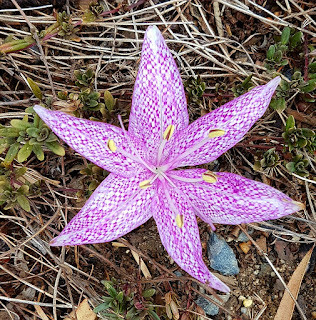 David had posted this on the SRGC forum and I wrote to ask if we could use his photo and a little bit about this Australian Native plant. 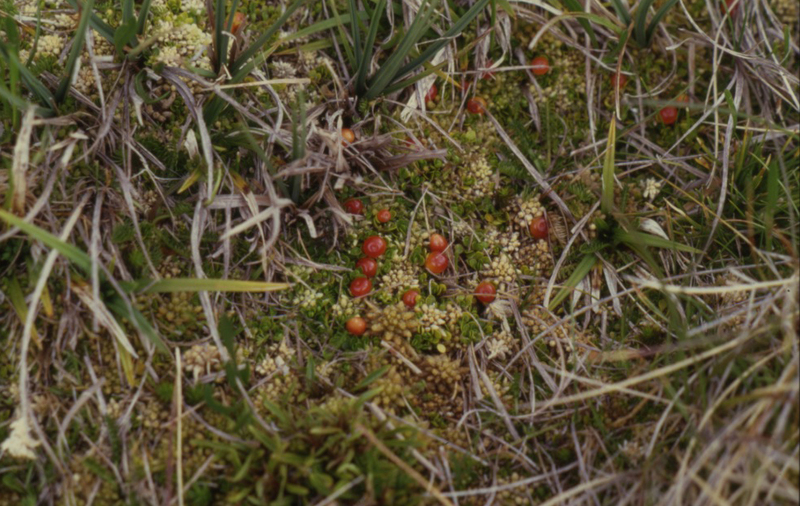 I have seen it growing and fruiting on Cradle Mountain, Tasmania with two fruits, no where near as beautiful as Davids plant. Dave said his plant was a gift from Lesley, also a New Zealander, whom many will know from the lecture she gave on Crocus many years ago. Lesley told Dave she had received seed from Marcus Harvey and managed to raise one plant, that set and produced seed in her garden. Dave writes "surprisingly for a plant found in wet peaty spots in the wild, mine has done very well here in a cool part shaded sand bed, with new growth creeping along and has been in fruit for over the last 2 months"
Thank you so much Dave for such a rare plant that is being grown to perfection. 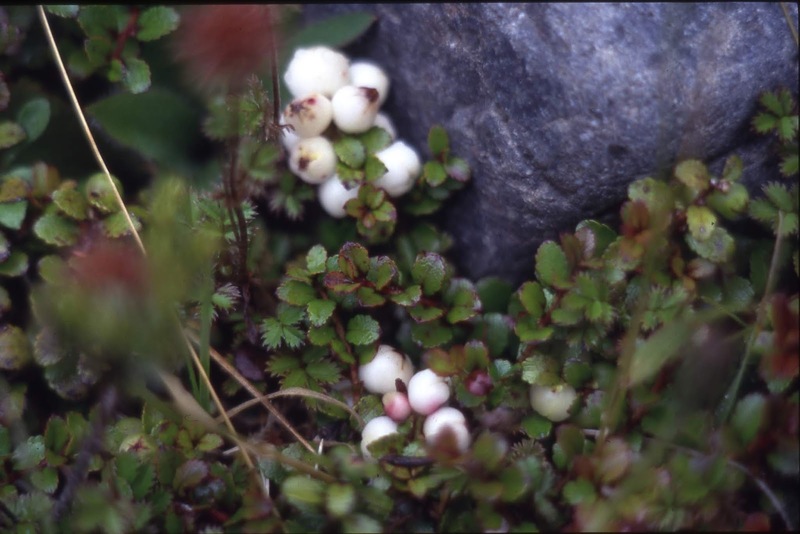 The fruit of Vaccinium Glauco-album above imported from Peter Cox Scotland by Felice Blake and Otto in the late 1970's. Otto thinks it should be more widely grown in Australia. It forms a lovely shrub about 80cm high. Vaccinium-vitis idaea flower below and fruit above a very hardy species once established will spread to about 80cm wide by about the same height. Maianthemum racemosa Syn. Smilacina racemosa flowers above and fruit below from British Columbia seed exchange 1984. Available for sale now in Victoria in quite a few Nurseries. Prosartes smithii Syn. 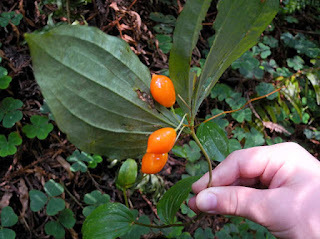 Disporum smithii Photo's are courtesy Mary Sue Ittner who kindly gave me permission to use her two photo's of her Prosartes smithii fruit. The top photos are of the fruit as it first comes out and then fades to this beautiful quite large, three sided, orange fruit. 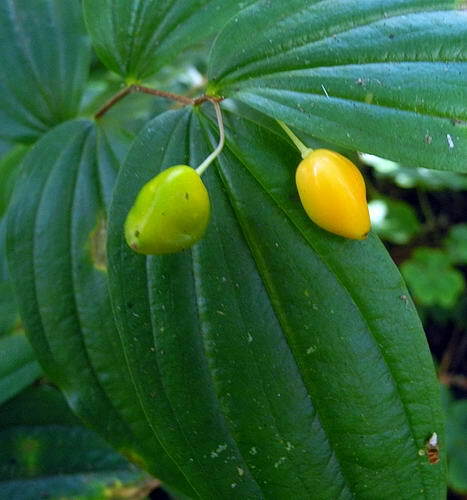 These fruits are on the plants for quite a long time, making it prominent in the garden over Autumn. 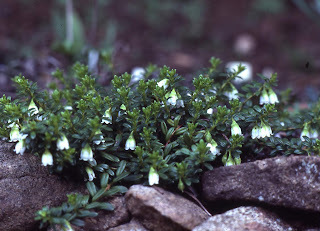 Eremophila debilis Fermi & Will's plant and photo's. 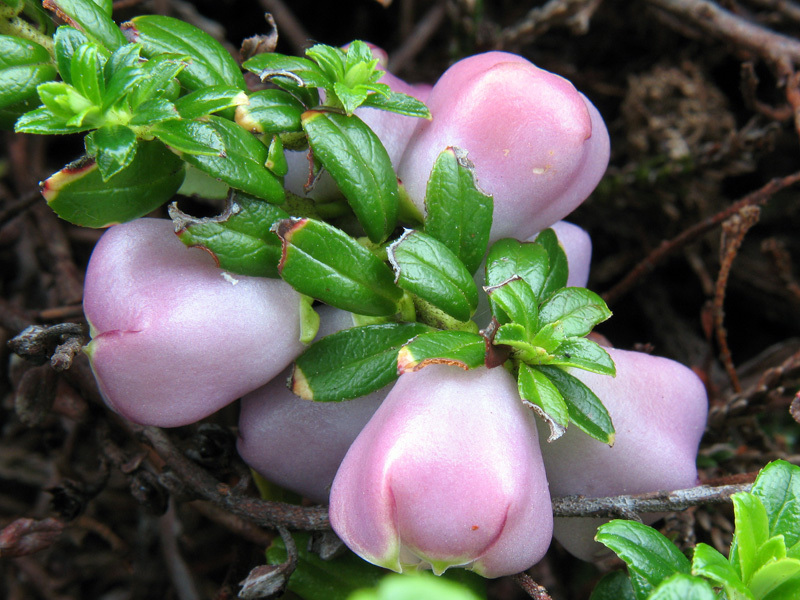 Eremophila debilis commonly known as Winter Apple. 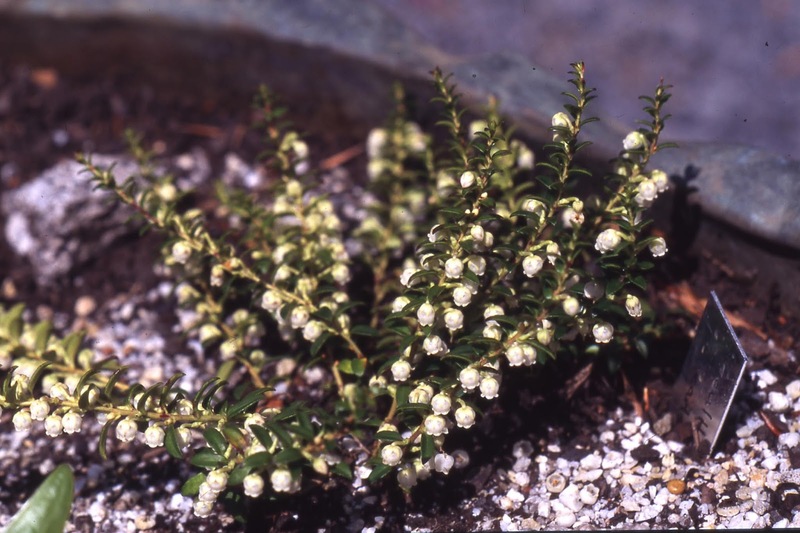 Australian native , a prostrate shrub that will grow to a meter, but may be kept smaller with pruning. Frost hardy with white to reddish, purple fruits. Nertera granadensis syn N. depressa below moved into the glass house to protect the fruit. I have also seen this coloured fruit form growing at Dinner Plain, Victoria. Crataegus tanacetifolia after a long hot summer and treated vey badly when we moved to this garden. Roots left lying under a piece of shade cloth for months luckily it was winter. The fruit will be gone soon as the birds will move in and devour them in days. There are many more fruiting plants trees, shrubs and ground covers all are beautiful in our gardens providing beauty in Autumn and providing food for the many birds that live in our gardens. Our next meeting is by an author who has written a book about Reginald Farrer & William Purdom two wonderful plant collectors at 8pm on the 27th April at the Olinda Community House, Olinda Monbulk Road, Olinda. A favourite of mine but very much out of date now, but a joy to read and look at those beautiful hand drawn, water coloured illustrations. Merendera large flower, seedling in with Crocus seed from Marcus. Colchicum bowlesianum a form of Colchicum bivonae from Mrs Hawthorne. Colchicum 'Conquest' import by Otto from, Janis Ruksans. Colchicum kotschyi Archibald seed 1986 collection number 314.750. 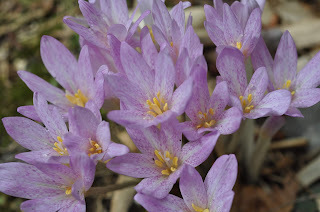 Colchicum corsicum from Barbara and Philip Gordon. Colchicum byzantinum below and byzantinum Album above. The white and the pink flowers always have a tiny deeper pink on the very tip of each petal which fades as it ages. One way to identify C. byzantinum. Colchicum The Giant a hybrid, looks like speciosum but the flower is much larger. Colchicum variegatum Jon's photo. Seed grown from Marcus Harvey collected, Ambelos, Stamos, Greece. Colchicum sfikasianum Marcus, Near Agios Focus, Mani, Greece 50m. Allied to Colchicum lingulatum but has a smaller corm and broader leaves. 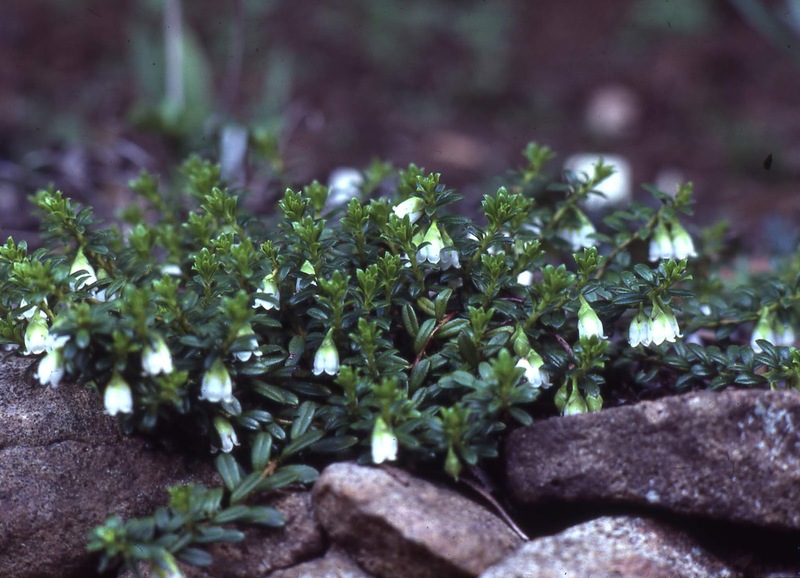 Campanulate in shape and faintly tessellated, endemic to the Peleponnese though fairly abundant. I can't find my bulbs so I may have left them in my old garden, somewhat disappointing.